Order the Limited Edition Black Stainless Metal Finish Vitamix Ascent A3500 through Blending with Henry HERE! It's exclusive to Vitamix.com through Blending with Henry. Canada customers click HERE to order and get fast free shipping. The most beautiful Vitamix ever made! Vitamix is on a roll this year making beautifully functioning kitchen tools for the aspiring chef at heart, as well as for the rest of us who enjoy tinkering in the kitchen. If you're like me who loves creating your own special recipe blends, or likes throwing anything in the blender and see what sticks, then you will love the Vitamix Ascent Series A3500. It's versatile enough for the novice as well as the skilled chef. Earlier this year I did a full review of the original A3500, and now Vitamix has added more color options, such as the featured Limited Edition Black Stainless Metal Finish, which is more beautiful in person than what you see in the included pictures. On the left is the original Vitamix Ascent A3500 in Brushed Stainless Metal Finish. In the middle is the new Graphite Metal Finish and on the right is the Limited Edition Black Stainless Metal Finish. There is also a unique white color Ascent A3500 (not shown). The Limited Edition Black Stainless Metal Finish (on the left) differs quite a bit from the original Brushed Stainless Metal Finish (on the right) in that it appears as an infusion of a black tone in the metal that gives a very premium look. The brush strokes in the black metal are also much more pronounced and the front panel metal accents are also infused with a beautiful black tone. Depending on the lighting, at times it can have a slight bronze hue. It's simply stunning and will add a touch of style to any design kitchen! It's definitely the Rolls Royce of blenders. The Vitamix Ascent Series A3500 also is available in Graphite Metal Finish. It features a matte finish which resists scratches and fingerprints and may appeal more to families due to it's simple design that can withstand oily fingers and is easier to keep clean. It's design will fit in almost any kitchen style and it offers all the same features of the Brushed Stainless models. I really like this design! 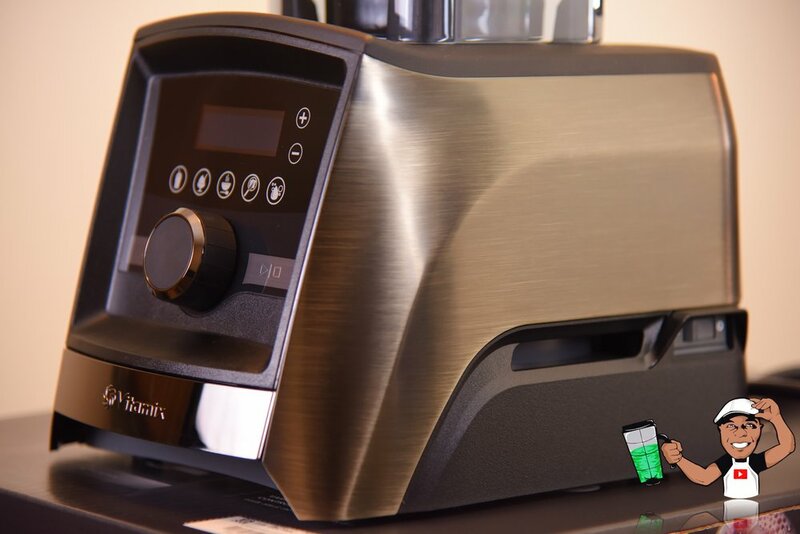 As with all Vitamix Ascent Series models, they feature the Self-Detect technology which automatically detects which type and sized containers that are attached to it for different types of blends. Featured is the Ascent 8oz Bowl Kit which is my personal favorite for making dips, salsas and milling spices. It's simply perfect for making baby food. You can order the Ascent 8oz Bowl Kit through Blending with Henry and get fast free shipping HERE! So, which one of the three is my personal favorite? Well in my eyes the Limited Edition Black Stainless Finish is simply stunning and the most beautiful blending product I have ever seen. In my opinion it belongs in a premium style kitchen. I actually love the Graphite Metal Finish. It offers a bold look and I love the easy to clean matte finish. If you love the Ascent Series Limited Edition Black Stainless Finish then grab one through Blending with Henry with fast free shipping HERE! It's exclusive to Vitamix.com through Blending with Henry. Canada customers click HERE and get fast free shipping. NOTE: Vitamix Ascent machines in this first look blog were provided to Blending with Henry with no influence on the review. I would love to hear your thoughts on all three of these models. Please feel free to drop me a comment or reach out to me for more information HERE!